Hello! Another month flew by which means I accomplished another month of wedding planning tasks! Hooray! I got to say, I think I’m go a pretty good track, definitely checking off a good amount off the list and even got a little bit ahead in some other areas! If you’re just starting to plan your wedding, be sure to check out my post from last month, which happened to be my first month of wedding planning. 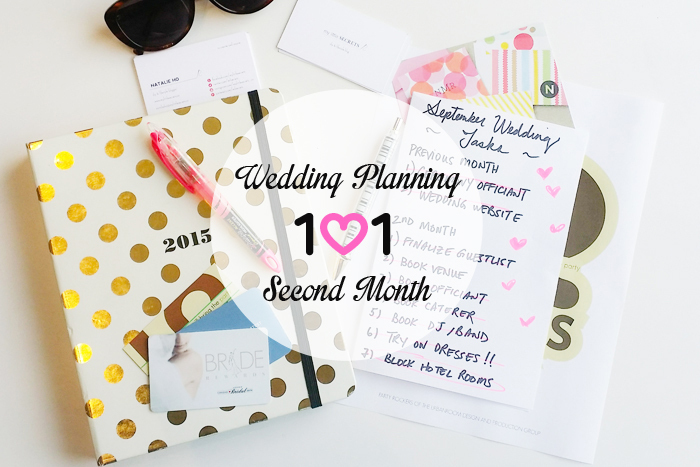 Not only are you going to find my month by month task list in this Wedding Planning 101 series, I have and will continue to share some more details around specific wedding related things I’ve been working on, what vendors I’ve came across and what I’ve been successful (and not so successful) with. Make sure you check back frequently whether you’re planning your own wedding or a dear friends’. I am happy to answer any questions or make any suggestions for you! Complete! We met and booked our ceremony officiant just this past week. We were referred to Martin of Ceremonies With Choice by a friend who were married by a fellow colleague of Martin’s. This was definitely an area that I wasn’t too familiar with and also did barely any research prior to meeting with Martin. However, Martin was super friendly and very informative in regards to our ceremony options. He gave Kyle and I a lot of examples in terms of how we can run our ceremony and specifically how to make the ceremony unique to us as individuals and as couples. We came away with several ideas on what we can do to incorporate our loved ones into our special day, and we’re excited about this process. When it came to making a decision on booking our officiant, we focused on the ‘vibe’ we got from Martin. He seemed very passionate about his work and the couples he worked with in the past and certainly had the credentials to also prove it. In progress! I waffled between several options. Whether to build one from scratch, use a free wedding website template, or using perhaps something that was a hybrid of both. If you’re unsure what the options are, read this great post from Eileen at from YesMissy, she chats about several options and the pros and cons for each. I finally decided to to build mine from a website template builder – SquareSpace. It’s super easy to use and there is a lot of flexibility in terms of customizing the page layouts and design. SquareSpace offers a couple of pricing options, which runs you no more than $200 for one year. I started to build my website, however, not quite ready to show you the final result yet. I’m still waiting on some design elements to come together before I can call it “live”. Be sure to check back and see what the first glimpse looks like and I’m more than happy to share some tips and tricks with you! Complete! We were ahead of the game and finalized our guestlist during our first month of planning! It really helped in terms of working out details with our wedding vendors. First thing they tend to ask is “How many guests?”! Complete! Again, we were slightly ahead of the curve and booked and finalized our venue last month! You can read about our experience and find out which venue we booked. We are SOOO excited! Complete(ish)! I wouldn’t say we are 100% done with this as we haven’t actually booked our caterer yet. However, we have selected who we will work with and actually, we attended our complimentary wedding tasting last night. Can I say, AMAZING! We visited 10tation‘s kitchen last night as they are one of six preferred caterers our venue suggested. Alanna and the chef were truly hospitable and we got to sample essentially ALL the items we are considering for our wedding reception. The food was so well prepared, Kyle and I not only thought it was good, but it was DELICIOUS! The food portion of our wedding is extremely important to us. We’ve said many times that we want to offer something unique and delicious (and steaming hot) to our guests and I think we are in really good hands. A few things we really want to accomplish with our menu is to offer a selection of items that appeal to the general crowd however strong flavors are preferred as we’re bringing together two cultures, I think choosing with an ethnic twist is a good tribute to that. We also want to ensure we offer a variety of items, so that we’re not ONLY focusing on meat lovers but also take care of seafood lovers and vegetarians. Therefore we are focusing our appetizers on vegetarian, fish, and rarer meat items and keeping our mains to poultry and beef. Complete! Another win here! I went to the National Bridal Show a few weeks ago and to be totally honest, I’ve never been a huge fan (I’ve attended in the past with some other girlfriends). However, I totally lucked out and found the one and only vendor that I liked and contacted – URBANROOM Events. They specialize in private events only, i.e. not club DJ’s, and focus on gathering groups of people with different taste in music and bringing them together and having a good time. That is TOTALLY us. Kyle’s buddies are absolutely into country whereas my girls love top 40s and hip hop/R&B. I thought it’d be challenging to make these two very important groups of people happy, but Peter from URBANROOM didn’t seem think it’d be a problem at all. We had the pleasure to meet with Peter earlier this week as well and walked through the DJ/Live Music requirements with him. He was also able to show us some lighting options which we will be requiring to glam up our night. We are so excited to work with him and looking forward to incorporating not only several genre of music but also some live music. It’s going to be such a fun party! Complete! I SAID YES TO THE DRESS! I’m thrilled to share that I choose my dress and only after 2 weekend of visits! 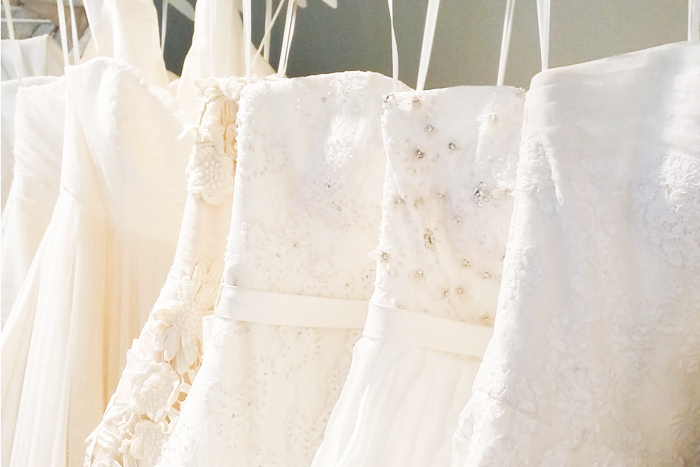 Ironically enough, I ended up picking a dress I tried on at the FIRST bridal salon I visited – Felichia Bridal. Obviously I’m not yet able to reveal what dress I picked, but it is totally what I had envisioned and I’m really excited try it in my size and alter to fit me perfectly. I didn’t have too much of an idea in terms of what dress I wanted. However, I knew I didn’t want something too ‘poofy’ or with too much fabric. I want to be effortless in my dress on our special day. The truth is, you’re really not going to have a clue until you give the different styles a try. 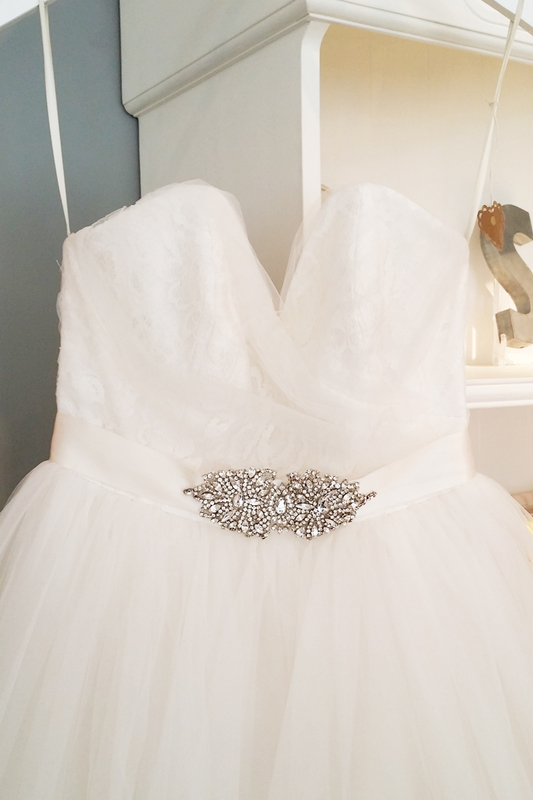 I tried on a BEAUTIFUL princes gown (below) at Sash & Bustle. Though I didn’t end up with this one, the princess style gowns were gorgeous and they really do make you feel like a princess! Incomplete but I’ll be on it this month! Seeing that our wedding date is around the Pan-Am games taking place in Toronto. I think that hotel rooms will fill up quick and to ensure our out of town guests are taken care of, I’ll be contacting neighboring hotels soon to block of some rooms for our wedding! I’d recommend you do the same if you’re hosting your wedding late June through to July in Toronto! I hope you were able to gain a few insights from my second month of planning! 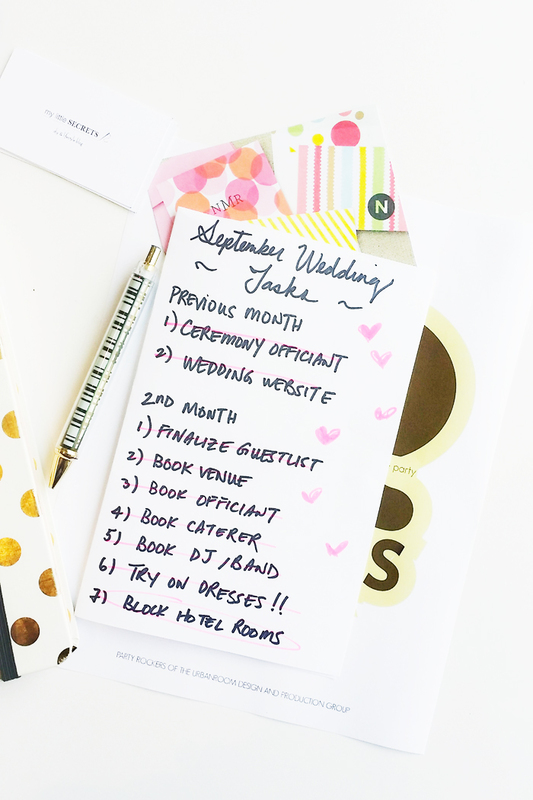 This month, my main focus is getting my guestlist contact info in order as we’ll be sending out our Save the Dates! Chat soon and have a wonderful weekend, will ya?! Wedding Planning 101 :: Two Months Left! Looks like your wedding planning is going great! Thanks for including me in your post too!